Manhunt Underway For Suspect In Attack On French Christmas Market On Tuesday evening, a man opened fire on the famous market in Strasbourg, France, killing two people and leaving a third brain-dead. Hundreds of law enforcement officers are searching for the suspect. 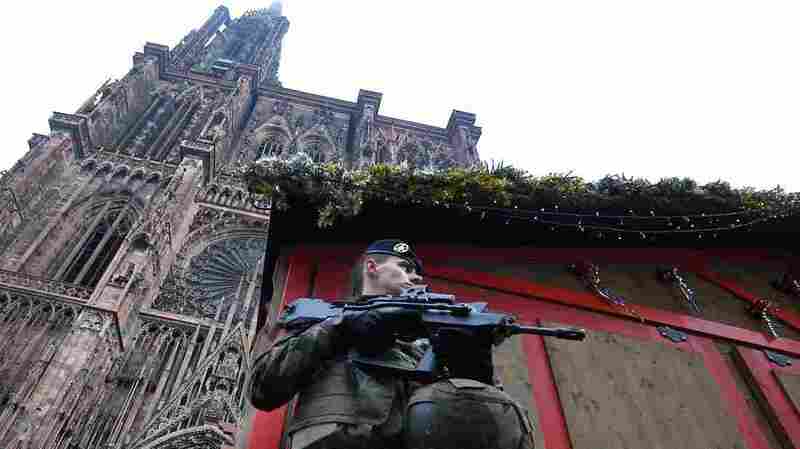 A French soldier stands guard at the Christmas market in Strasbourg, in front of the city's cathedral, as police conduct a search for a man suspected of opening fire on a crowd the night before. A manhunt is underway in France for a known criminal suspected of opening fire on a Christmas market in Strasbourg on Tuesday evening, killing two people and injuring more than a dozen others. Authorities in Germany also are on high alert in case the suspect crossed the border. Hundreds of law enforcement officers are participating in the search, Jake Cigainero reports for NPR from Paris. Witnesses said the gunman shouted "Allahu akbar," Arabic for "God is great," before opening fire on the popular Christmas market around 8 p.m. local time on Tuesday, according to prosecutors. At a news conference Wednesday, Paris prosecutor Rémy Heitz confirmed the two deaths and said a third person had been left brain-dead. He said the suspect used a handgun and a knife during the attack. After a series of terror attacks in Europe over the past few years, security has been increased at many attractions such as Christmas markets. Soldiers and police were on the scene when the shooting began. The suspect exchanged gunfire with soldiers and was shot in the arm, Heitz said, before fleeing the scene in a taxi. The man reportedly bragged to the taxi driver about the attack. "They say he was a 29-year-old man born in Strasbourg with a criminal record unrelated to terrorism. His criminal record was mostly robbery in France and Germany, where he spent prison time. "[Chekatt] had already been flagged for surveillance by security services for religious radicalization after his time in prison, but [France's] Interior Ministry said he was not suspected of plotting any attacks and they haven't officially called this terrorism yet." On Tuesday morning, before the attack, authorities in Strasbourg visited Chekatt's home to arrest him on suspicion of homicide. They reportedly found a grenade, a .22-caliber rifle, knives and ammunition — but not Chekatt. Authorities suspect that the police visit to Chekatt's home might have triggered the attack, according to Cigainero. Authorities have detained four suspected associates of Chekatt's, but Chekatt still has not been found. "A neighbor, who asked not to be named because the gunman was still at large, said he was rarely home. She said she last saw him Monday from her window, which looks out on a common hallway, and he was with another man. "Young men from the apartment block said they knew him as someone who seemed destabilized by his time in prison. 'You can just tell,' said one, lightly touching the side of his head. They, too, feared being publicly named because the gunman is still being hunted by police." The massive Strasbourg Christmas market is one of Europe's most famous — it's been held annually since 1570, according to the city. It receives some 2 million visitors a year, Cigainero says. In 2000, French and German authorities foiled a plot to bomb the market on New Year's Eve. The five accused conspirators, who were living in Frankfurt, Germany, were allegedly linked to al-Qaida; four men were ultimately convicted of conspiracy to murder. In 2016, an attack on the Christmas market in Berlin left 12 people dead; the attacker hijacked a truck, killed its driver and then drove the truck into a crowd of people. The suspect in that attack was at large for several days. He was ultimately shot and killed in a standoff with Italian police in Milan.